Found your website, my father was aboard the U. S. S. West Virginia, BB-48 during WWII, our family all served in the Navy. 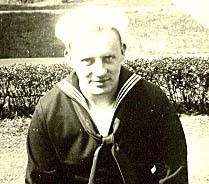 His information is as follows, CARL OWEN MADDOX, born 15 September 1922 in Jackson County, West Virginia, entered the navy on 15 March 1944, after basic was assigned to the Wee Vee at Bremerton Shipyards. He was aboard for the following battles, Leyte Gulf, Surigao Straits, Mindora, Luzon, Iwo Jima and Okinawa. His service number was 928-78-59, his rank was 3rd. Class Petty Officer, his rating was Electrician's Mate. He was awarded the Victory Medal, American Area, Asiatic Pacific with 4 stars and the Philippine Liberation with 2 stars. He was discharged to U. S. Naval Reserve status on 18 January 1946. Would like to get his information on the crew member part of the site. Carl is still living. food they had spam 24 hours a day 7 days a week. One day he got a package from his wife and guess what, it was a huge can of SPAM. To this day he can not and will not eat spam.